For many Bostonians, Saturday, November 28, 1942, was supposed to be about college football. The undefeated Boston College team had only to beat lightly regarded Holy Cross to assure a trip to the Sugar Bowl. But Holy Cross stunned BC 55–12 and by midnight Boston was faced with a far greater shock. 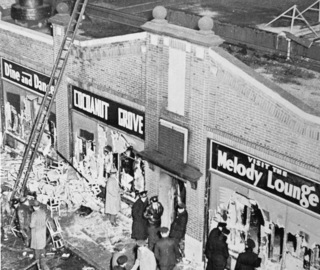 Four hundred ninety-two people had perished in flames at the Cocoanut Grove in the worst nightclub fire in U.S. history. The tragedy was over in a matter of minutes as flames and fumes swept through the two-story building, and the exits that weren't locked were jammed with panicked patrons. Some escaped through luck, fate, or guile (a busboy stuck his head in an ice cream bucket to avoid the fumes), but many more died horrible deaths. Even today the Boston Fire Department continually fields requests for documents on the blaze. Fire buffs still debate its true cause; lawyers, doctors, and building contractors continue to work under its impact. 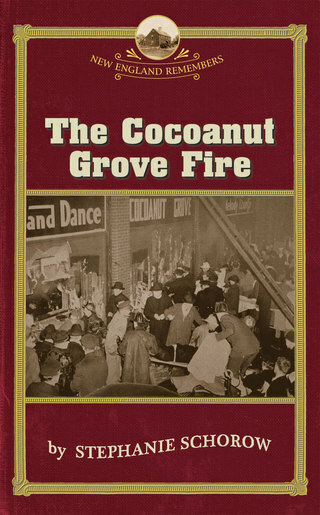 For most Bostonians, however, the true story of the Cocoanut Grove is its devastating effect on the hundreds of individuals who were caught in a maelstrom of heat, smoke, panic, and pain—individuals out for a night of fun who were doomed by greed and thoughtlessness. Interviewed by the Boston Globe about a play on the fire by a Texas playwright. An interview on the Cocoanut Grove fire in Bay Village at the site. An interview following the release of police transcripts of interviews. Stephanie discusses the Cocoanut Grove fire at the Old South Meeting House. 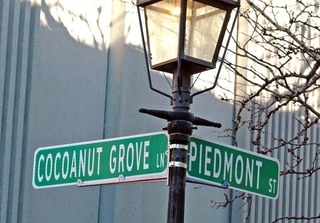 Shawmut Street Extension, at the site of the tragic nightclub fire, was renamed Cocoanut Grove Lane in November 2013 to honor the victims of the fire. After a successful movment, headed by Dr. Kenneth Marshall of Watertown, Shawmut Street Extension was renamed Cocoanut Grove Lane. I have heard this story over and over again, with numerous variations. An African-American man even said his parents were turned away at the door that night because they were black. At first it was intriguing, then frustrating – how could all of these people been headed to the club that night? And then I realized that these stories contained a greater truth – that all of Boston felt they had a brush with death on November 28, 1942. That this was a horror that could have happened to them. It was a tragedy that engulfed the city and beyond. In the last two days, I have found myself telling people: “I was just at the library last week. I was just on Boylston street having dinner.” Friends are telling me how they were watching the marathon but left before the bombs went off. An acquaintance describes how she was several blocks away. Others are posting in social media about the injuries to friends of friends. Like the 1942 fire, this will be a tragedy that will resonate down the years, trauma passed down to generations in the form of stories of how grandfather or grandmother narrowly avoided death that day. In the course of my Cocoanut Grove research, I went through newspaper files of photos of the victims provide by family members: graduation pictures, snapshots, wedding picture. I tried to look at each one, seeing them as a person, not a victim. The day the bombs went off in Boston, there were bombs going off in Bagdad, killing at least 55. And there were probably other terrorist strikes as well – bloody, irrational murders of innocents – innocent who will be faceless and nameless to Americans. I was not directly affected by the bombs; my story is not gripping or poignant. I grieved through TV images (“ I was just there!”) and Facebook posts. Many of us are trying to see some kind of meaning in this tragedy; whether terrorism, militia, lone wolf. In my Cocoanut Grove research, many people expounded on how Boston College folks cancelled plans to be at the club that night because the football team lost what was supposed to be a sure win against Holy Cross. They saw the hand of God. But many victorious Holy Cross fans went to the club and I can’t see anything but the quirks of fate in action. I believe we are better people in Boston now than in 1942. 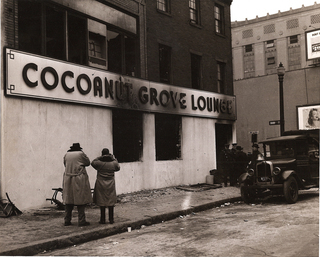 There were numerous reports about the looting of the bodies of the Cocoanut Grove victims. A man once called me to tell me how he learned his father, as a teenager, grabbed wallets from the dead; he burst into tears confessing his father’s sin, sickened by the stain of his own genetics. There was the story of the man who begged someone to take him to the hospital, promising him $300. The man passed out and woke up in the hospital to find $300 taken from his wallet. Yet then, as now, people lined up to donate blood, and the staff at Boston City Hospital and Massachusetts General made heroic efforts to save all they could. Today we have a security net for those injured. In the 1940s, the Grove victims eventually received only about $100-$200 each for their pain and suffering from the estate of the club. Only one person ever served jail time in relation to the fire—the club owner – who was allowed to go home to die after only a few years in prison. Today we have heroes to celebrate, even as we mourn, and we are convinced that someone will be brought to justice, no matter how long it takes. Someday, I’m sure, there will be a public monument to the victims of the Marathon attack – a place where we can bring flowers, meditate on loss and suffering, and remember the bravery of ordinary people, marathoners, firefighters, police and others who did what we could. There will be speeches about how “We will never forget.” There is no such monument to the Cocoanut Grove victims, just a simple and worn plaque in the sidewalk in Bay Village marking the club’s location. Bunches of flowers are still sometimes left there. In Boston today, we will tell our stories, over and over again, suffused with the knowledge we all could have been there; it could have been us, we were just there minutes, hours, days before the bombs went off. A literary cocktail representative of Boston's intoxicating story: its spirit of invention, its hardscrabble politics, its mythology, and the city's never-ending battle between personal freedom and civic reform. Stephanie Schorow serves up a remarkable cocktail representative of Boston's intoxicating story: its spirit of invention, its hardscrabble politics, its mythology, and the city's never-ending battle between personal freedom and civic reform. Schorow has successfully captured the excitement and drama of firefighting in Boston. The tragedy that shaped fire history. The inside story of the infamous crime that captivated Boston. Check the Facebook page for my newest research project. This was a nice interview by Radio Boston, done at J.J. Foley's in the South End.